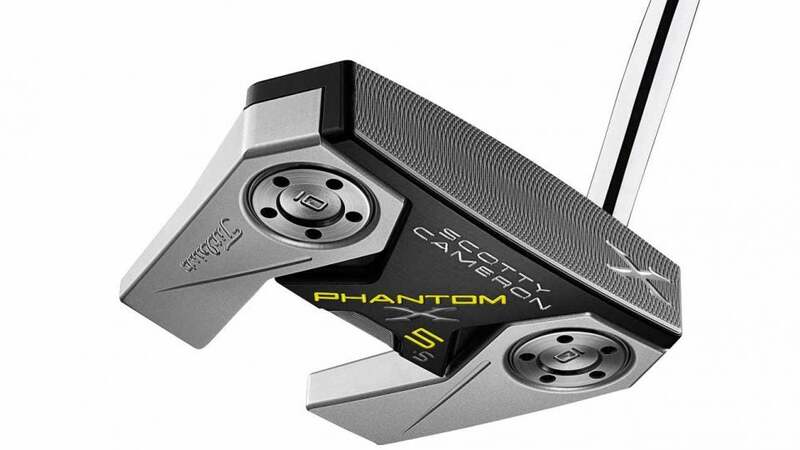 In a jump forward from the popular Futura line, the newest Phantom X putters ($429 each) from Scotty Cameron represent the highest-tech high performance mallets ever produced by the famed putter designer. Based on five different clubhead styles with a variety of shaft bend and alignment options that yield nine new overall models, the new Phantom X line replaces the Futura family and should offer a model for just about any stroke type. Each of the new mallets feature a multi-material construction with a stainless steel clubhead and milled solid aluminum face that extends through the flange areas of each head, as well as enhanced vibration dampening technology. All Phantom X mallets also feature a new Pistolero Plus grip with a less tapered lower section. Here’s Titleist’s rundown on all the new models: Phantom X 5: The evolution of this Tour-proven wingback mallet with a single mid-bend shaft continues with a solid aluminum face anodized in black that extends back into the stepped down flange, framed by misted stainless steel. Three milled topline sight dots painted neon yellow and framed with polished aluminum provide simple but effective alignment to the sweet spot. Phantom X 6: A face balanced mallet with a single mid-bend shaft provides distinct alignment cues, with two long neon yellow sight lines milled into the stepped down flange, framing three milled sight dots on the misted black anodized topline. Customizable sole weights increase MOI and stability through the stroke. Phantom X 6STR: Constructed without a spud and with zero offset, the straight shafted 6STR produces face balanced performance with a clean and minimalist look at address. The topline sight dots of the Phantom X 6STR are painted neon yellow for easy alignment in conjunction with the extended neon yellow sight lines in the stepped down flange. Phantom X 7: A single mid-bend-shafted, near-face balanced setup, Phantom X 7 features a heel-to-toe tapered aluminum face that is sculpted into a raised center flange for a continuous, connected surface from the leading edge all the way back. Framed by stepped down, angular stainless steel components, the Phantom X7 combines the benefits of long flange sight lines with a semi-traditional topline for easy horizontal and vertical alignment at setup. Also available in a left-handed model. Phantom X 7.5: With a single low-bend shaft crafted to promote enhanced toe flow with forgiveness, the Phantom X 7.5 employs a raised center flange offering a continuous, connected surface accented with neon yellow alignment cues from the leading edge through the back flange. Also available in a left-handed model. Phantom X 8: Inspired by touring professionals seeking a putter with simple visual cues and a continuous transition from leading edge through the back flange, the Phantom X 8 is a sleek, near-face balanced mallet with a single mid-bend shaft. Milled sight dots and neon yellow sight lines perfectly frame the golf ball for seamless alignment without distractions. Phantom X 8.5: Differing from the Phantom X 8 only in shaft bend length and increased toe hang, the Phantom X 8.5 offers players an unbroken, sculpted flange from the putter’s leading edge through the back flange with a single low-bend shaft to promote a slightly arced putting stroke. Alignment is easy with bright visual cues. RELATED: Scotty Cameron explains magic behind Tiger Woods's putter Phantom X 12: With swept-back wings precision milled from 303 stainless steel, this near-face balanced, high-MOI mallet with a single mid-bend shaft employs the continuous alignment features of the Phantom X line’s full leading-edge-to-flange construction — crafted from aircraft grade aluminum, anodized black and accented with neon yellow sight cues. The ultimate in technology, stability and forgiveness. Scotty Cameron Phantom X putters will be available at retail on April 12th.